DAVE SIMMS is a renassaince man. My first exposure to him came through music, as we both play with the all author band SLUSHPILE, whose members also include Heather Graham and F. Paul Wilson. Me and Dave hit it off immediately, both being musicians and writers. 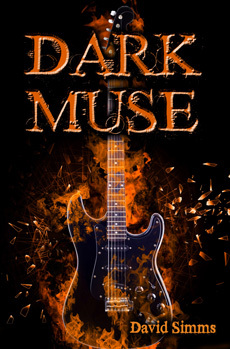 When I heard his debut Young Adult novel “Dark Muse” was due out, I thought it’d be a great time to check it out and learn more about Dave, his work, his life, and what he’s got in store for the future. Can you tell us a little bit about DARK MUSE? Where’d it come from? DARK MUSE is a story of the legend of the crossroads, where musicians used to go to sell their soul for fame and fortune. Since this was a YA novel, I changed it up a bit and answered that question – “Where do musicians get their ideas from?” Enter a dangerous, horror-fantasy-filled world where music is alive and the inspirations for many of the world’s best songs originated. It’s an adventure but also a discovery about what people can do when they don’t listen to what others think they should be. People have called it a combination of Raiders of the Lost Ark and Harry Potter by way of Heavy Metal. I’ll take that. The novel came from a combination of a few places. First, I’ve been giving guitar lessons since I was sixteen. It got to be lucrative when the 90’s bands became big and kids could learn all these easy songs. A few years go by and suddenly, a few begin to ask, “Do you know anything by that guy Hendrix? AC/DC? I kinda nodded and said, “let’s go.” Guitar Hero and Rock Band followed and seemingly, every teen I met wanted to learn all of the classic rock songs and were bored by the pop punk bands. I still don’t quite get it. I also teach special education and I noticed that hardly any stories featured people with disabilities (mild or severe) in a positive light, especially not as heroes. The four members of the band are all based on favorite students of mine. Finally, it’s a wild trip down memory lane from my old band days, always waiting for the big break but losing out to the cool kids time and time again. What led you to writing this novel? I tried writing a “normal” novel right before DARK MUSE. It was going somewhere but this other idea kept at me. I wanted my first published novel to be more “adult.” However, my profession is one that seeps into the soul and I guess it stuck. I keep being inspired by my students, many of whom are told by so many others, including school personnel, that they won’t go anywhere in life. Many of them do. I keep in contact with many of them and some of them are more successful – and happier – than most of their detractors will ever be. There’s a bit of me in there, too, but that’s for another time. Music seems to be so integrated into your novel. You even play with SLUSHPILE, a group of authors including Heather Graham and F. Paul Wilson. How does music go with your books and stories? I noticed that from my first ever story I sold that music seemed to be entrenched somehow into most of what I wrote (at least the good stories). “Write what you know” and all that stuff. I guess there’s something to it. The stories became more varied and touched upon different genres but music seemed to be a part of much of it. In my current novel (the one I’m shopping to agents now and crossing my fingers), the main character carries a guitar pick with him everywhere but music is far from the point of the story. It’s about one of the darkest points in American history that most people don’t know about but the blues finds itself wound around a few characters. As for SLUSHPILE, what a cool experience! Beginning back when we were the Killer Thriller Band and about ten members, we played to some cool audiences – and when we streamlined ourselves to the strong core we have now (after we found a pretty cool bass player), we found magic. To think that people have let us play at the House of Blues in Disney World & Cleveland, the historic Brighton Pier in England, and in New York City on a massive stage with 80’s style excess, it’s beyond surreal. Good writing has a rhythm to the prose. Songs have to mesh in every way, from vocal melodies to guitar chords to multiple drum parts – just like novels have to coalesce in every element. One piece goes astray and the whole shebang goes to the trash bin. Both are so rhythmic when they work.Do you listen to music when you write? Yes, and no. Never to anything with strong vocals. Blues works big time. Guitar or sax-based jazz works if it’s slower. Pink Floyd or Tool works. Acoustic guitar CDs always work. I did my Master’s study on music therapy and how it trains the brain to think differently. The brain – and body – work to match the music’s rhythm after about 15 minutes, no matter what the tempo. The best to relax with is something between 60-80 beats per minute – the heart’s resting rate – and best for zoning out and into that place where the mind can run wildI’m always curious about writer’s work schedules and environments. What’s yours? Mac? PC? Pen and paper? Where do you compose? Picture, if possible! I love my laptop, even though I’ve been on three in the past three years. PC all the way for me. However, I get my best ideas while driving. I taught for two years with a 50 minute commute. There was always a notebook or paper next to me and I became quite adept at writing on the wheel without looking. Since I write pretty sloppy, there wasn’t much of a difference in handwriting. My best organization tool is OneNote – incredible electronic notebook that can be sectioned and never needs to be saved. Multi-colored and easy to add pictures and hyperlinks, it helped plenty with Dark Muse and the historical thriller. 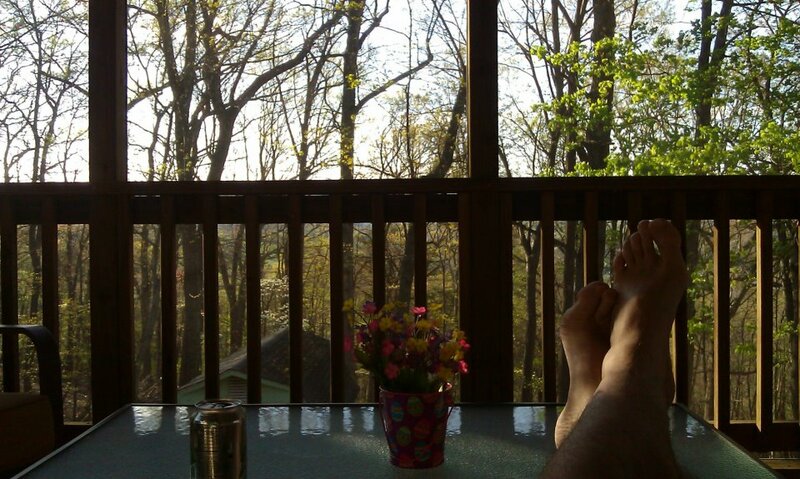 I write anywhere but do my best work on the back porch, with views overlooking the mountains in the Shenandoah Valley. The man-cave ranks a close second. The pictures show this and my assistant. You’re a new dad. A huge life change. Has it affected your creative life? How do you balance real life and your imaginary ones? See the picture to understand how it affects my writing. Of course it has affected me, mostly in the way of finding time and focus. I think cloning myself would be the best route to take but I wouldn’t change a thing. Balance? I have no idea what that means anymore. 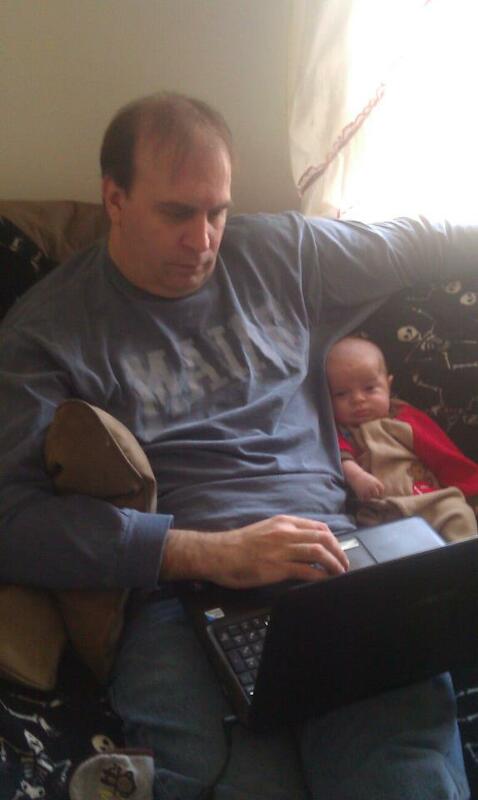 I write when I can, where I can, often with little hands reaching for the computer. Still, with Sawyer here, I have more motivation now than ever before to find my way and produce the best books possible. Well, the historical novel is being looked over by a couple of agents and I’m crossing my fingers. It seems I moved into a town so rich in history that I now give ghost tours based on the town’s fascinating stories. The most interesting is about a piece of American history that will never be taught in schools. A nightmare existed in the early 20th century that was pure evil – and was accepted by far too many – until we saw it taken to the next step in Germany. It’s far more horrific than anything in fiction yet I discovered that no novel had chronicled the events. Hopefully my story reaches people. What I’m writing now is more YA but focusing on the male side of things and taking the horror to a level I haven’t seen in the teen realm yet. I’d like to write the next few novels I have outlined in different genres. Somehow, all have a little music in them and just a little more darkness. Where can folks grab a copy? It’s available at Amazon and through the Fire and Ice website: Fireandiceya.com. It’s been sighted in a few physical bookstores as well. At my website, DavidSimmsMuse.com, my Facebook page, and at conferences everywhere, especially where the band is playing.